We are determined to offer an excellent quality Polyester & Jewelry Labels to our respected clients. The offered range is made under the guidance of our experienced professionals using the optimum grade material and leading technology. These labels have a printable barcode and protecting details which are attached to the ornaments that displays its weight and price. We provide these labels in varied sizes to meet the specific needs of the clients. 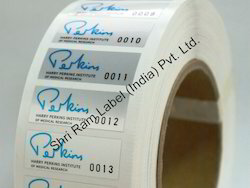 We are considered as an eminent manufacturer and supplier of Polyester Labels. Owing to the features like superior finish, premium quality and tear resistance, it is highly acclaimed by our clients. The offered range is made using high quality material that ensures its high adhesion strength and durability. Moreover, our clients can avail the offered range from us in various sizes as per their precise requirements. Our organization is instrumental in offering a wide gamut of Polyester Jewelry Labels to our prestigious clients. These labels are extensively applauded by the clients for its unmatched quality, high adhesion strength and durability. Our entire range is available in different sizes according to the requirements of the customers. Clients can avail the offered range from us at reasonable prices.